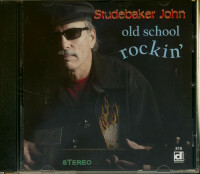 Studebaker John aka John Grimaldi was born and raised in Chicago. While doing a joib for his father’s plumbing firm on Maxwell Street, he first heard the raw blues on the open market. Hound Dog Taylor became his Godfather, and he mastered the slide guitar. John and his band are maintaining the rough, deep down sounds from Chicago’s joint joints and neighborhood bars – and it shows! Electric down home blues – recorded live in the studio. 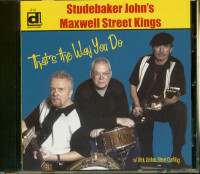 Studebaker John – voc/gtr/hca, Rick Kreher – gtr, Bob Halaj – bass, Steve Cushing – drums. 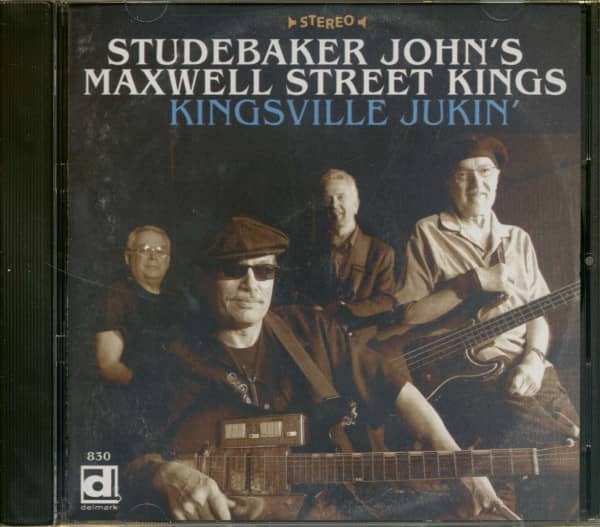 "Studebaker John's Maxwell Street Kings"
Like the classic auto that he named himself after when first embarking on his prolific blues journey. Studebaker John keeps right on roll-ing. offering devotees of tough, no-nonsense Chicago blues. A rollicking. raucous ride viv-idly conjuring up the idiom's hallowed heyday. John was proud to be old school long be-fore the term became fashionable, combining full-bodied harmonica. crashing slide guitar. and no-holds-barred vocals into a convincing whole. He's also a talented songwriter. Spirited echoes of his Windy City blues heroes can be detected floating through his songs. but there's no doubt they're all his. After more than four decades in the blues business. Studebaker John has paid his dues in full. Chicago native John Grimaldi was drawn to the harmonica when he was seven years old. picking up his father's chromatic and blowing his first notes. A couple of years later, the lad was a helper for his old man's construction plumbing firm. There was a job on Maxwell Street. the legendary open-air market, and dur-ing a break Grimaldi happened across Big John Wrencher, holding musical court with a small amplified combo. The one-armed harpist didn't require a fancy chromatic to wail, wringing bent notes from a standard diatonic model. 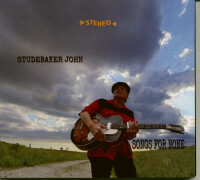 That's how Studebaker John discovered the blues. It wasn't an overnight conversion. During junior high and high school, John played drums in amateur rock and roll combos. at time doubling simultaneously on harp without using a rack. He added vocals to his musical arsenal as well. The bluesier emissaries of the British Invasion left their mark. By the late '60s. John decided to concentrate on blues. leaving the less seri-ous stuff behind. Muddy. Elmore, Little Walter, and the Wolf had seduced him permanently. The last piece of the puzzle fell into place at an all-ages show starring the lovably rowdy Hound Dog Taylor. When Hound Dog unleashed his blistering slide, making magic on the hum-blest of guitars (making it all the more cosmic. fellow bottleneck master J.B. Hutto sat in that day). John knew he had to follow suit. Before long, he'd mastered the slide guitar as well. 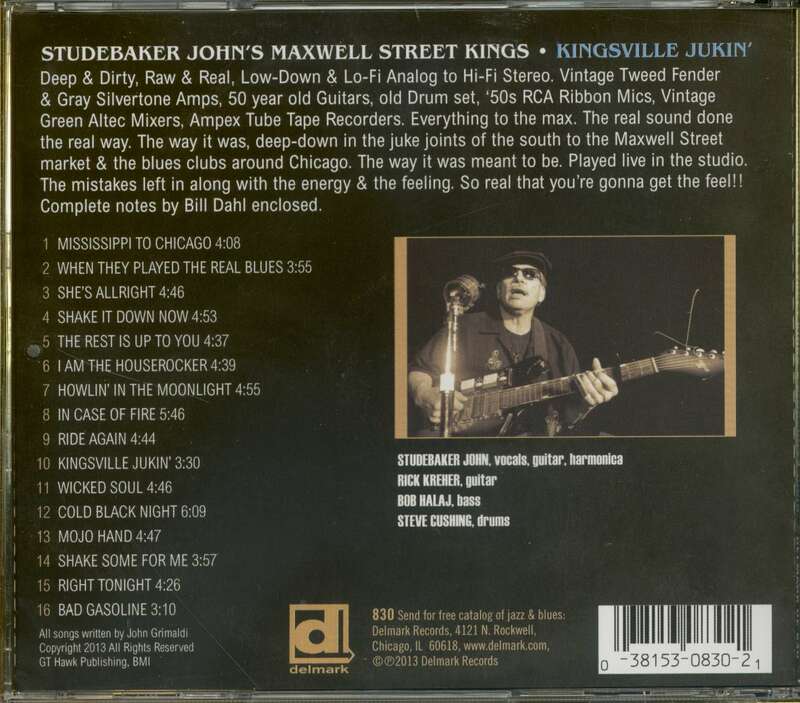 Maxwell Street became John's musical stomping ground when that legendary thor-oughfare was really jumping. You could buy anything your heart desired on that delightfully gritty avenue, the accompanying blues sound-track coming as a free bonus. Big Walter Hor-ton, Johnny Littlejohn, and plenty more were right there in the flesh, tools of their trade in hand, pumping out raw. invigorating blues on the bustling street. Big Walter's savvy advice to John about the importance of developing a style of his own resonated deeply. Just to make sure folks didn't forget his singular so-briquet, the young bluesman drove a Stude-baker Lark (he now pilots a 1963 Studebaker Silver Hawk—a cool car for a cool cat). Learning his trade took John all over the South and West Side. He sat in at the Check-erboard with Buddy Guy and Junior Wells, mounted the stage at Theresa's. and gigged at holes-in-the-wall where anything could hap-pen and sometimes did. John formed the first incarnation of his rowdy combo, the Hawks, and got down to business as a professional bandleader. Most of the blues greats were still active and maintaining their citywide follow-ings, but John persevered. making inroads on the North Side as the decade progressed. In 2010. Studebaker John and his Max-well Street Kings—guitarist Rick Kreher and drummer Steve Cushing (the longtime host of National Public Radio's Blues Before Sunrise)—joined the Delmark Records fam-ily. Their first storming release, That's The Way You Do, stands as one of John's fieriest releases to date. a joyous celebration of the raw. relentless sounds that once defined the Maxwell Street experience. Customer evaluation for "Kingsville Jukin' (CD)"